The dramatic story of Friends Good Will speaks to the history of commerce in the early 1800s, as well as her role in the War of 1812. Stand at her bow, feel the wind on your face, hear the crack of her billowing sails and her 6-pound pivot cannon. Do more than imagine how seamen felt as they set sail for uncharted courses--experience it for yourself. Friends Good Will also visits ports outside of South Haven. Check the Voyages page to find out when she will be visiting a port near you. 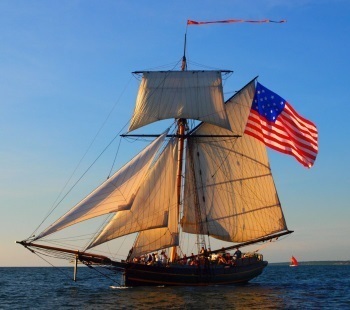 Friends Good Will is also a member of Tall Ships America. As a member tall ship, we support their mission of sustaining and educating through tall ship culture in North America. Friends Good Will was built in Michigan at River Rouge in 1810 as a merchant vessel. In the summer of 1812, she was chartered by the federal government to take military supplies to Fort Dearborn, a small military and trading post at what is now Chicago. She was returning with furs and skins when she was lured into the harbor of Mackinac Island. The British, having taken the island just days before, were flying false colors above the fort ramparts. The British confiscated the vessel, cargo, and crew, renaming her Little Belt. She was armed, taken into service, and fought with the Royal Navy until September of 1813, when she was recaptured by United States Commodore Oliver Perry at the Battle of Lake Erie. Within an hour after the great guns fell silent, Commodore Perry mentioned her in his now famous dispatch, "We have met the enemy and they are ours: Two Ships, two brigs, one schooner and one sloop." That sloop was Friends Good Will. Friends Good Will then served in the United States Navy, transporting General William Henry Harrison's troops across Lake Erie in the successful invasion of Southern Ontario. She was driven ashore in a storm south of Buffalo in December 1813. In early January 1814, during efforts to re-launch the ship, the British unceremoniously burned the once-proud vessel during a raid on Buffalo. On August 29, 2004 Friends Good Will departed from the ship yard of Scarano Boatbuilding, Inc. in Albany, New York for South Haven, Michigan. 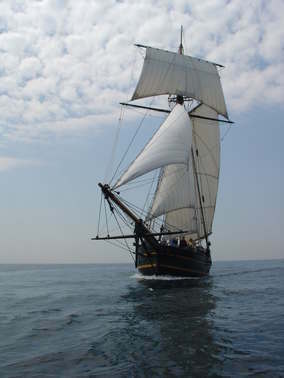 For more information on the Friends Good Will, visit our webpage about Her Maiden Voyage.